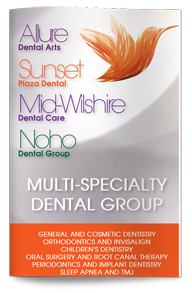 Our dentist in West Hollywood welcomes you to Sunset Plaza Dental. We offer an extensive selection of general, restorative, pediatric and cosmetic dentistry services. A smile that looks good and feels even better can be a powerful source of self-confidence, which is why we have made it our goal to help you achieve healthy, attractive smiles that are well grounded in at-home and in-office preventative care. We welcome patients of all ages, backgrounds and dental health needs. Our dental team is professional and compassionate, and we will work together with you to create the smile of your dreams. Our office has been designed with your needs in mind. You will be greeted warmly, and we will provide you with the information you need to make good choices about your dental health. Our offices are equipped with the latest equipment and diagnostic and treatment technology to ensure that you enjoy a fast, effective, comfortable dental experience, and we will design a treatment plan that addresses your needs for prevention, restoration and cosmetic dental needs. Our Goldenwest HMO dental insurance dentist in West Hollywood is committed to fostering a positive atmosphere that encourages good dental health. We believe that the right combination of patient education and preventative care can help all patients enjoy improved dental health. Our staff has experience treating patients of all ages and a variety of needs, and we can customize sedation solutions to ensure your utmost comfort throughout any procedure. We welcome new patients and build strong relationships with all members of our dental health family. We accept most forms of dental insurance, including Goldenwest HMO, and we accept a variety of payment options. Contact our West Hollywood Goldenwest HMO dental insurance provider today to learn more about how we can improve your smile health or to schedule your appointment.